The Center of Harmony’s main lot, it will hold approximately 18 cars. Also, The Center of Harmony’s back lot is available. This begins at the edge of the greenhouse and extends along the length of the building. *** The three spot to the left of the greenhouse are private resident parking, please don’t block. Also the garage behind the Center is private, do not block either end of it. The Center of Harmony’s back field. 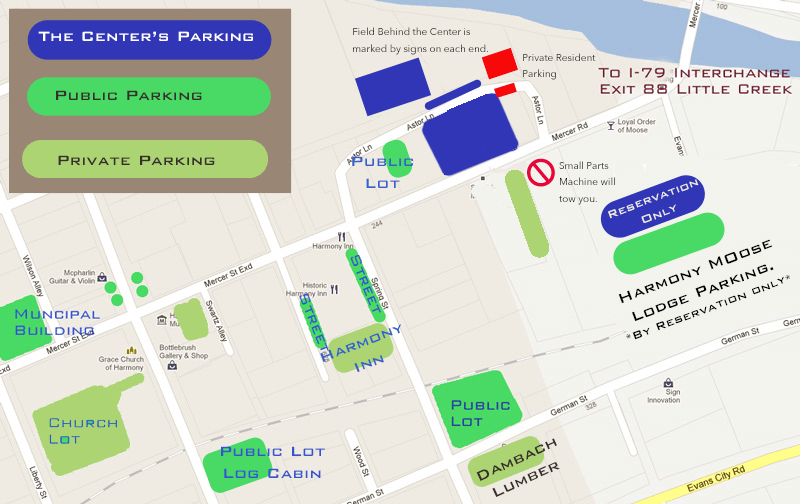 There is ample parking for vehicle in the back grass lot. You may park anywhere between the signs posted at either end. If our parking lot is full, please try to use the public and street parking first. There is ample parking wishing a block or so. The other local businesses need their parking and we try to be good neighbors. There is parking available directly across the street beside the Velvet Salon and Harmony Emporium. This is their private lot. Our guests are permitted to use them whenever those businesses are closed. Typically after 8PM on weeknights. ** DO NOT PARK in the “SMALL PARTS MACHINE” Parking lot adjacent to the Center. They have posted their lot and will call the police for trespassing charges and have you towed. It’s ridiculous, but it’s happened already. Dambach Lumber Lot, Available after 5PM weekdays and Noon on Saturdays.